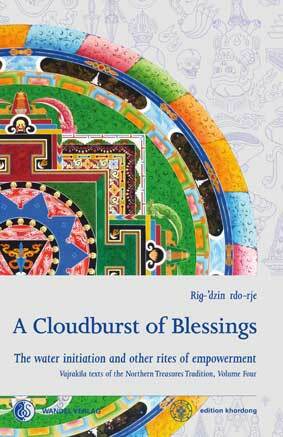 We am very happy to announce our fourth book of our Vajrakila series: “A Cloudburst of Blessings. The water initiation and other rites of empowerment for the practice of the Northern Treasures Vajrakīla” by Dr. Martin Boord (Rig-’dzin rdo-rje). This book explains in detail how an empowerment is done, what are the actual parts, what preparation is needed, how the teacher and the disciple needs to be prepared, and what is done in the often several days lasting ceremony. The book begins with the translation of two empowerment ritual texts from the treasures of Rig-’dzin rgod-ldem. An in-depth commentary by the renown scholar and master of the Byangter tradition Rigdzin Padma Trinley accompanies the praxis texts, and are accompanied by further texts of Khandro bDe-ba’i rdo-rje: “The Rite of Liberation: eliminating inimical forces by divine wrath”, which consists of notes on the supreme view, as well as the “Vajrakīla Empowerment of Long Life”, another treasure text of Rig-’dzin rgod-ldem, which can be used for ones own benefit and for the sake of others. You will find an extensive introduction and annotated translations with several illustrations. In this way the book will be very helpful to understand the ritual of empowerment in depth, so the disciple becomes able to follow each step and makes use of them for deepening the experience of empowerment for the benefit of all. The book will become available on new moon day, the 18th of December 2017. May it be auspicious. Of crucial importance in the life of anyone who wishes to follow the path of secret mantra, the occasion of a tantric empowerment stands out as a pivotal moment of guidance in which the stages and direction of the path to be followed are made clear. All too often, however, practitioners in the western world have been forced to remain little more than spectators, patiently witnessing the profound initiation rites of their own ‘vajra empowerments’ as outsiders, because the rites are conducted in a foreign language and in a manner that is not at all easy to understand. Now, in order to encourage full participation by English-speaking disciples who wish to take the mantra path to heart, a complete series of ritual empowerments for the deity Vajrakīla in the tradition of the Northern Treasures has been translated and annotated. Bringing joy to disciples, may all confusion be dispelled and may the clear light of wisdom illuminate the world! “Intended only for dedicated disciples of outstanding integrity, the purpose of a tantric empowerment, initially bestowed by the sprinkling of water, is to wash away defilements and purify the disciple’s body, speech and mind in order to prepare him or her for the profound practices of speedy maturation and liberation on the stages of development and perfection. Being led into the very heart of the teachings, symbolised by a throne at the centre of a spacious maṇḍala, the worthy disciple is introduced to his own buddha nature in the form of a wisdom deity and is taught to meditate upon the special qualities and activities of that deity in order to awaken and strengthen these potentialities within himself. Receiving the seed of the mind of enlightenment (bodhicittabindu), in both relative and absolute forms, directly from his guru, the disciple is subsequently taught how to arouse and maintain this precious essence within himself. The table of content and prologue pages are available as PDF (784 KB) here. This entry was posted in Books, English Books, New Publications, Vajrakila Series and tagged Tantra, Vajrakila, Vajrayana. Bookmark the permalink.